"No. 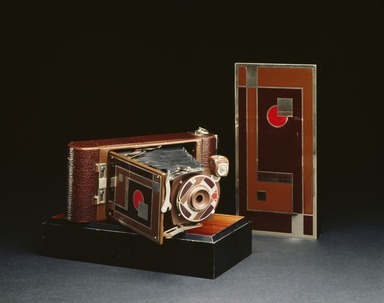 1A Gift Kodak," bellows type camera in metal case, partially covered in brown leather with rectangular portion over bellows enameled on silver with modernist designs in red, dark brown, and tan. Circular plate around lens also enameled with red, dark brown, and tan. Leather carrying strap attached to one end with metal. CONDITION: Good, a few chips in brown enamel plate covering bellows.